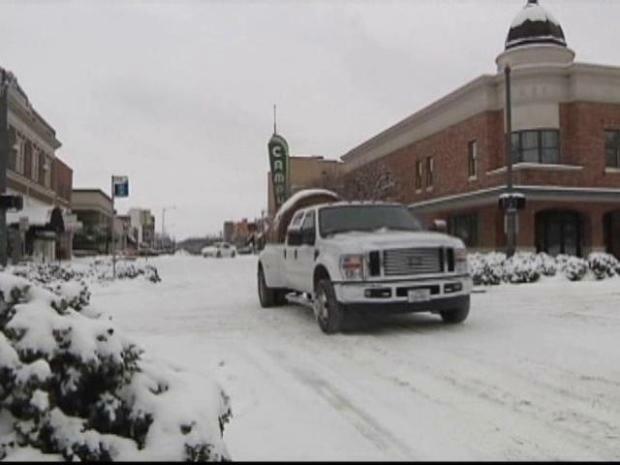 Denton County is digging out from as much as 6 inches of snow after snow fell most of the day. While shoveling snow may be a chore for most, Tommy Richardson said it was a solution to his cabin fever. "I saw a shovel, and said, 'What the heck? Let's do something," he said. Richardson cleared the sidewalks in front of the Sweetwater Grill and Tavern in Denton. The restaurants owners, Jimmy and Karen Meredith, said people have flocked to the hot drink specials and warm chili. Denton County residents do what they can to curb cabin fever. "Everybody's been off work and out of school, and everybody's been gathering here," We've had lots of fun and lots of business," Karen Meredith said. "Yesterday was great -- a big party all day." But outside the restaurant, it was a different story, especially for people who braved the roads. "It was so, so slick," Shay Hewitt said. "I almost got nailed by like two cars. I come out to scrape my car, and there was like 6 inches of snow. It's insane." North Texans venture out for the first time in almost a week to burn off some cabin fever. The unexpected heavy snowfall piled on top of icy side streets. On Interstate 35 in Denton County, driving was difficult for many. Despite the dangerous conditions, families found ways for fun. "We are going to make another angel, a snow angel," three Denton sisters said.